Tell us about your game! Escape from Alcatraz is an adventure game where, obviously, you need to Escape from the Alcatraz prison! The game was inspired by an old Brazilian text-adventure game, and to keep the same ‘vibe’ as the original, it has retro style looking graphics. How is the app different from similar apps? Unlike most adventure games, the game is viewed from the top, most like a rogue-like game: as you walk new parts of the map appears on screen. This actually adds to the exploration aspect of the game as it also fits the escape mood in general. Also, the game has some unique puzzles – they start very simple, but later on the solutions are far from obvious. Adding to all of that, the game features an ‘eternal’ player list: the first 10 players who finished the game, has their names forever in the high-score list! Tell us about the design. 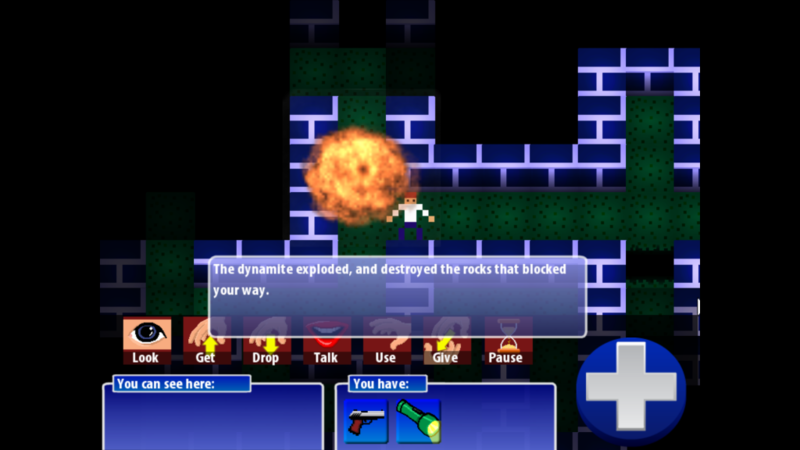 I have a whole article on Damedev.net here, which describes the choices I did on the user interface. 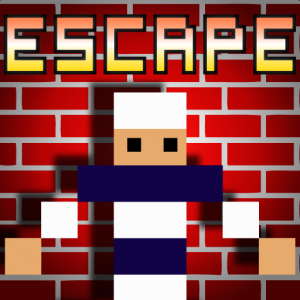 The game icon itself was designed to pass the general game idea as quickly as possible to the player: it shows the main character (drawn in blocky graphics to show the game has a retro look) against a wall with a strong light pointing at him (an holophote, to put the escape part in evidence) and the word “Escape” above – all representing the classic “image” of the prisoner escaping and being caught by the holophote while doing so. What lessons did you learn and went right/wrong with the release? It was the most complex game I’ve developed in Monkey, a complete adventure ‘engine’, and it was done in 30 days – so I learnt a lot about the language itself, and how monkey works internally. I could also get a glimpse on how the classic adventure games I played when young were made. I think a lot went right in the game: it works really well on mobile and I could achieve the ‘mood’ I was aiming for (an adventure game, with retro graphics and rogue-like maps) – it was really fun reading the comments on the app stores, and even seeing friends addicted to the game. What went wrong was probably the in-game texts, which on small screens get really small and hard to read. 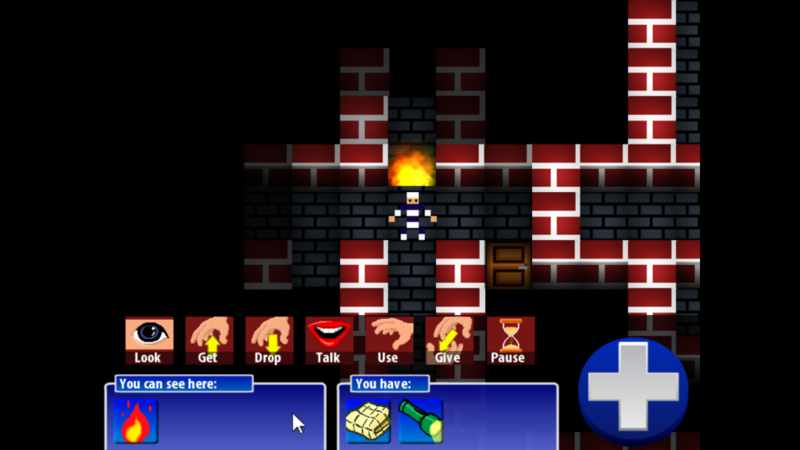 I could also take some extra time to refine the adventure system. Another thing is that people tend to go directly to the icons that represent objects and characters to interact, instead of first selecting an action – but this will be solved on a future update, where every object will have a default action attached to it (usually ‘use’ on objects and ‘talk’ to characters). Who is on the team and what are your roles? 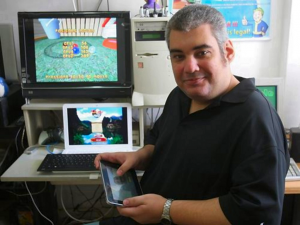 Just me, José Lucio – I did the entire thing by myself from creating the whole story to programming. There are projects where I work with other people (usually graphics artists and musical composers) – but on small scale project like Escape from Alcatraz, that had no budget at all, it was only me. What were you doing prior to building the app? Before Alcatraz I had another game released (and published) called Mahjong Max, for desktops and some small games on mobile. Most of them can be found at Icon Games website. I’m in college (I’m 39, but never graduated, so I decided to go back and get a degree) and I was/am also working on some non-game related contract projects. I have also organized a Brazilian gaming developer event called “Joga Brasil” (something like “Play Brazil”) in 2012. Having to juggle all those responsibilities gives me very little time to make games, so as I started developing for mobile, I also ended up making ‘smaller’ games. What other apps inspire you? A lot of old school games – some from a 80’s computer called MSX, others from Odyssey and NES… I still have those machines working, so every now and then I’d play some old games to remember where and how everything started :). As for an actual ‘app’, I would say the music player on my phone (the pre-installed one on WP8) – everywhere I go, I need some tunes playing in the background. Head over to the Apple App Store or Google Play to download Escape From Alcatraz. Hey you app devs! Wanna be featured like our friends at Escape From Alcatraz? Be sure to check out http://www.powerslyde.com/get-discovered.